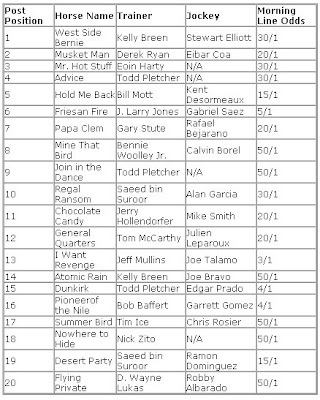 Louisiana Derby (G2) romper FRIESAN FIRE (A.P. Indy), who started off as the 5-1 fourth choice on the morning line, has been bet down to 9-2 favoritism for Saturday's Kentucky Derby (G1), as of 7 p.m. (EDT) on Friday. 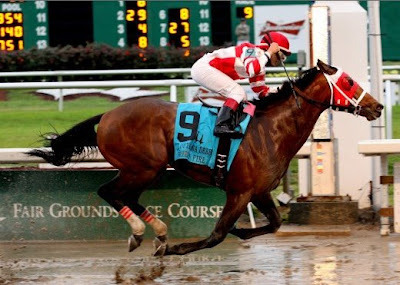 Coming next in the early-bird wagering is Blue Grass S. (G1) victor GENERAL QUARTERS (Sky Mesa) at 5-1, plummeting from his 20-1 morning-line price. Florida Derby (G1) runner-up DUNKIRK (Unbridled's Song) has likewise seen his odds go up to 8-1. CHOCOLATE CANDY (Candy Ride [Arg]) is the only other runner in single digits, trading at 9-1, while PIONEEROF THE NILE (Empire Maker) has risen to 10-1. I Want Revenge commands the lowest paying Oaks/Derby double ($1) with Rachel Alexandra (Medaglia d'Oro), yielding a return of $6.10. The Rachel Alexandra/Friesan Fire double will pay $7.10.